The federal government just announced it is stepping up efforts to help smokers kick the habit, and ban cigarette smoking in public places. Local nonsmoking bans are spreading across the country, turning up the heat on landlords who remain undeclared when it comes to whether they should allow tenants to smoke. If you could do one thing to make your apartment units or buildings safer and cleaner for your tenants, while protecting your property value, what would it be? If you could potentially reduce your turnover costs and secure a discount on insurance, would you be interested? Across the country, and particularly here in the Midwest,apartment owners and management companies are doing all of the above by adopting smoke-free policies for their rental properties. A unit where smokers have lived is more expensive to prepare for the next tenant. Fire danger is reduced if smoking is prohibited. Discounted insurance rates are often attainable for nonsmoking buildings. In Michigan, Wisconsin, Minnesota, California and other states, landlords are reaping the benefits of maintaining some or all of their units as non-smoking. Such activity has not yet reached the tipping point in Indiana. 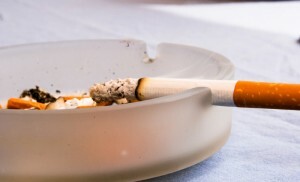 However, the Indiana State Medical Association (ISMA) adopted a resolution in September 2006 to educate owners and managers of apartment complexes about the risks of second-hand smoke and methods to create smoke-free buildings and common areas. No known safe level of exposure to second-hand smoke currently exists. Cigarette smoke is a group A carcinogen, the same group as asbestos. Second-hand smoke has been proven to cause cancer, heart disease and sudden infant death syndrome. Tobacco smoke aggravates chronic illnesses such as asthma, chronic obstructive pulmonary disease and emphysema. If a resident is injured or made seriously ill by involuntary exposure to tobacco smoke in one of your buildings, the individual may choose to take legal action, and your insurance may not cover that liability. Fair Housing Laws will require a reasonable accommodation if a resident or prospective resident has a disability or chronic illness that is made worse by exposure to tobacco smoke. The reasonable accommodation could be a move to another unit. Or the smoker who is causing the problem could be moved to another unit. However, accommodating a person with allergies, asthma or heart disease is not possible unless a designated non-smoking section or building exists. As a manager or owner of apartment buildings, you are not prohibited from regulating the use of tobacco inside your buildings or outside, in common and private use areas. Thats because there is no constitutional right to smoke and people who smoke are not protected by Fair Housing Laws — nor does HUD prohibit non-smoking policies in affordable housing. For the 73 percent of Hoosiers who do not smoke, smoke-free accommodations are an amenity. Just as hotels have found clients appreciate a non-smoking environment, apartment owners and managers should understand that non-smoking apartment residents desire smoke-free units. For more, see Renters Willing to Pay More For Non-Smoking. With AAOA, landlords have resources at their fingertips. Check out our Helpful Links page.American Apartment Owners Association offers discounts on products and services for landlords related to your rental housing investment, including rental forms, tenant debt collection, tenant background checks, insurance and financing. Find out more at www.joinaaoa.org.